MY FIRST YEAR as the Summit County Wildlife Biologist for the Utah Division of Wildlife Resources (DWR) has been filled with tremendous excitement, many challenges and an opportunity to experience firsthand the dilemmas facing wildlife managers and biologists today. It has become apparent that we live in a constant state of flux. Change and transformation of the natural world are now a constant, and wildlife management is much the same. Deer management in Utah undoubtedly continues to evolve and change as a result of the environmental, economical, social and political pressures placed upon a finite resource. To witness this and be a part of the wildlife management process has changed my perspective in many ways. Last month, I completed the annual spring deer classification on the Chalk Creek and Kamas wildlife management subunits. When we classify deer in the spring, we identify which deer are fawns and which ones are adults. On my first trip out, the winter snow was melting and giving way to muddy two-tracks and the first signs of spring green-up. I especially enjoy the early spring because I can get out and see the effects of winter on all the wildlife species and their habitats. These deer are eating the first grass of spring. Later in the spring and summer, they will add forbs (flowering plants) to their diet. Diversity of vegetation is the key to good habitat for mule deer. Scott McFarlane, another biologist for the DWR, once told me that the best biologists are those who are good at observing the natural environment. He says we all need to become “trained observers” and better understand the interactions between wildlife and their preferred habitats. I couldn’t agree more. Whenever I am in the field, I try to better understand why a particular species occupies a certain niche and the resultant relationships to the ecosystem. My effort to classify 400 adult mule deer on the Kamas unit began in the Browns Canyon area. While monitoring snow depths, winter conditions and the overall health of deer during the past winter, I had a good idea where quite a few deer were located. In a relatively short time, I was able to classify nearly 200 deer as either adults or fawns. Classification was quick and fairly easy. The deer were heavily concentrated in a small geographical area, which made my job much easier, but I soon realized that the deer simply had nowhere else to go. Destruction and development of once-productive winter ranges have limited these deer to isolated pockets of sagebrush near urban areas. Gravel pits, gated communities, condominiums and luxury homes have taken the place of crucial habitats that these deer once relied on. The challenges of managing mule deer on the Kamas unit are not much different from those of most other northern Utah locations. Development, highway mortality, depredation issues and increased recreational use on critical winter ranges have all taken their toll on mule deer populations throughout the Intermountain West. Of all the factors involved in managing the Kamas herd unit, loss of winter range to development is the most significant. In 2001, the Kamas herd unit had a population objective of 12,000 wintering deer. Later that year, the objective was reduced to 9,000. It was reduced again — to 8,000 animals — in 2005. 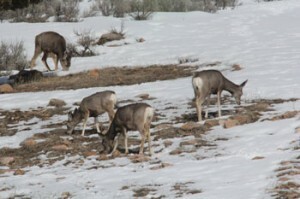 The 2011 estimated wintering population of mule deer on the Kamas unit stands at 5,950. This is quite a change from just 10 years ago. The Kamas herd unit management plan reveals that “the population objective was reduced in 2006 to account for permanent loss of deer winter habitat due to residential and urban development.” We need to turn this around. We cannot overlook the effects that winter-range development has on Utah’s mule deer population. Even more troubling is the fact that the Kamas unit encompasses 33,558 acres of winter range, of which 26,084 acres (or 78 percent), is held privately and is subject to future development. Management of the Kamas deer unit will undoubtedly be predicated upon the conservation and preservation of winter range. If we are going to return the Kamas deer herd unit to pre-2001 levels, we must place a special emphasis on protecting these unique habitats. We cannot simply wave a magic wand to create more winter range. We must take all steps necessary to protect the winter range that remains, and manage deer populations to the carrying capacity of the available habitat. Conservation easements on the larger tracts of land may provide a way to protect some of the range from future development. By all accounts, the future of mule deer in Utah is dependent upon preserving and protecting winter range. On the Kamas unit, this is especially true. Hi my name is selby warren I have hunted in kamas once for deer on the bow hunt last year at my uncles cabin I have seen a bunch of deer even bucks I almost shot a 4 pointer in velvet. but when muzzloader season started I went hunting in payson canyon in the central region I had no luck nothing but does and a spike buck wich was illigal to shoot. when the rifle hunt started we seen nothing but does and fawns and a monster bull elk that my dad spoted biggest 6 pointer I ever saw but my question leaves is there any bucks in the central region?